But, the attackers figured out that if you extract the word\document.xml file from a .docx ZIP archive save the Office document as a Office 2003 XML file, and rename it with a Microsoft Word file extension, such as .doc it will still open as a Word document on Windows systems. Unix systems using filemagic, on the other hand, consider it to be a plain XML file, because it is plain text content starts with <?xml. Update: in0d3 pointed out that these are actually Office 2003 XML files, not extracted OOXML Office 2007+ files like I initially thought. This gives the dropper an advantage: many email gateways and security appliances (including my sandbox) will treat the file as a plain XML file, and not treat it with much suspicion, while the Windows system will happily open Word. 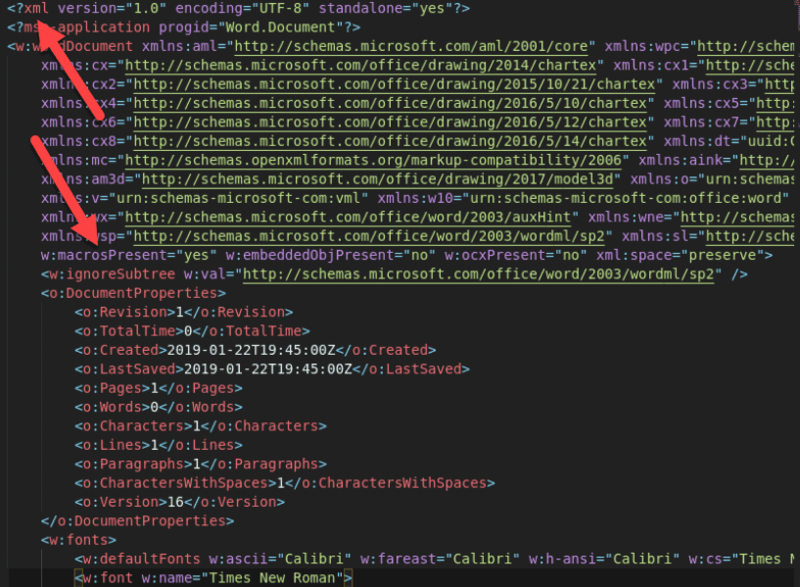 Fortunately, a Microsoft office document as raw XML that also contains a macro is also not a normal occurrence at all. It is very easy to detect with yara. From here, we can see the <?xml declaration, and the macrosPresent=yes flag, both of which will come in handy when writing a yara rule. 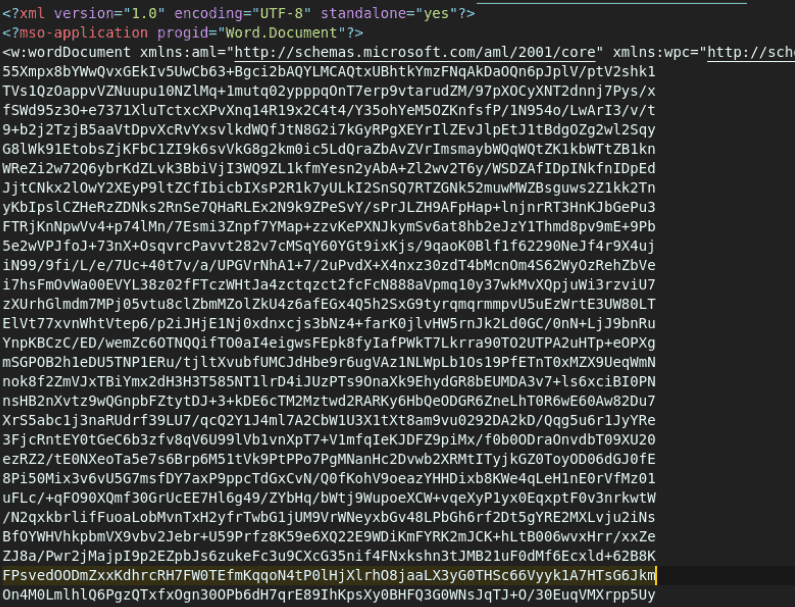 Scrolling down past the Word document boilerplate, we can see a chunk of data encoded in base64, enclosed in binData tags. 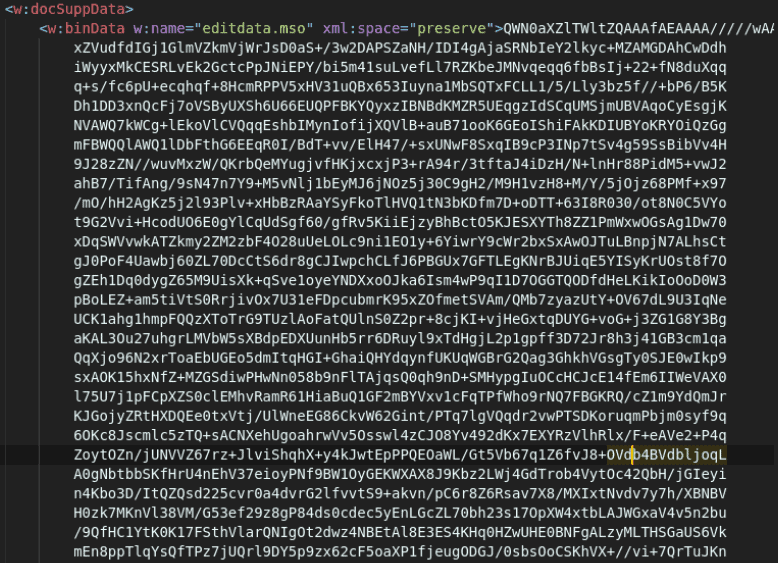 That is the obfuscated macro content. 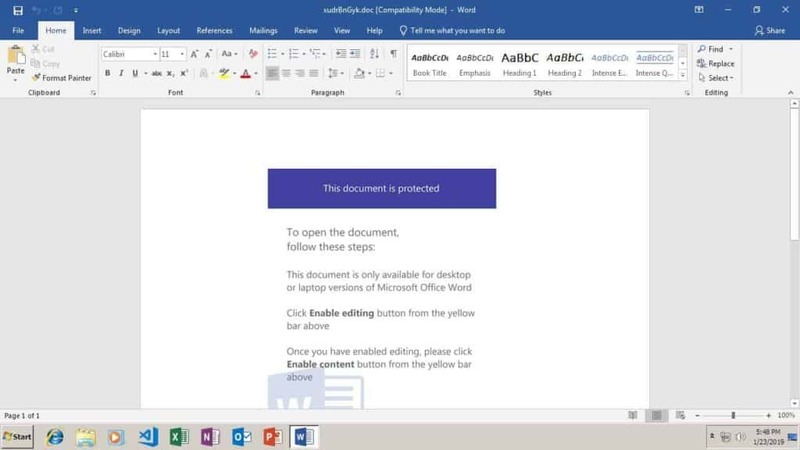 author = "Sean Whalen - @SeanTheGeek"
description = "Detects obfuscated macros in uncompressed Microsoft Office documents, as seen in a January 2019 Emotet dropper campaign"
As a member of the Yara Exchange, I get access to VirusTotal Enterprise in exchange for sharing Yara rules with the Exchange members, which would otherwise be a cost prohibitive subscription. VT Enterprise includes a feature called Retrohunt, which lets you run your Yara rules against all samples uploaded to VirusTotal in the last six months.